BAAANG! The next I knew... I was a re-enactor! Thanks to my brother (Sir Gerard De Rodes) I never really took to the romances of being a knight. Whenever we had family holidays which took us to castles as kids, being four years his junior, I always found myself being chopped up by him when the mood (and his vigorous imagination) took a hold. I went through my life stupidly without any interest whatsoever in dressing up in armour or wanting to dismember people. I was a "gun and camo" man myself. The years rolled by and the flab started rolling out and all of a sudden through the haze I remember hearing my brother's words, "I've joined a re-enactment group blah, blah, blah..... would you like to join?" I didn't. I had no intention of it. Admittedly, I was mildly impressed with the maille and sword he threw at me, but still didn't experience the relevant neuro-transmitters. Another two years past and after having my heart broken after the failure of a relationship and having not seen my brother for quite some time I contacted him.... another haze happened... and when it cleared I found myself sitting at a large wood fire, dressed in medieval clothes and surrounded by castle walls as the sun set over them with a horn of mead in my hands and the reflections of one of the best days I'd had in my life for a looong time going through my head: the feel of a maille shirt, my first time at swordplay, the archers loosing as many arrows as they could in one minute, the wide eyes of the kids in the crowd, the visit to a pub in the town with our armour on, the sun on my face and the calmness of the other re-enactors as they went about their buisiness. The calmness of the pretend 12th century I was in... all of a sudden... BAAAANG! The story of how I found my character is similar to my brothers; The factors of our name, Rhodes, and that I had been in St. John's ambulance as a teen and taken an interest in the crusades and the Hospitallers involvement kind of influenced the forging of my character. I just needed a way of coinciding my brothers findings of the De Rodes history with the time period portrayed by the Freemen of Gwent (which just so happens to be the same as that when the Hospitallers occupied Rhodes (freaky, eh?). And here I am... read on for my character's background. Now all I have to do is get the other half and the rugrat into it... where's a big BAAANG when you need one!!!? 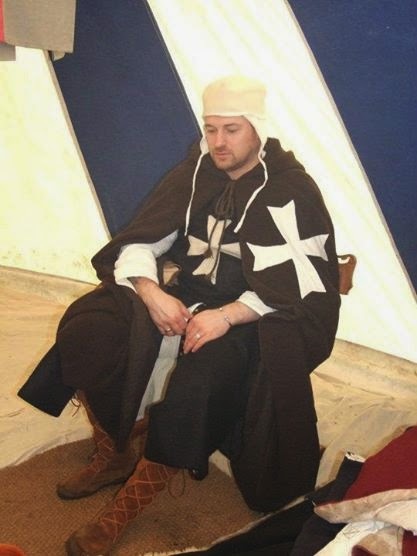 Coming from the knightly French class and having the influence and experience in battle he found induction into the Hospitaller ranks easy and elevation to brother knight-at-arms fairly effortless. André found himself envoy'ing to Europe regularly, tending to the affairs of his order in Wales and England ensuring things were running to the guidelines set out in Rhodes. The Hospitallers or the Order of St John of the Hospital of Jerusalem existed originally in the Holy Land to administer treatment and care to the Christian pilgrims who arrived in Jerusalem, more often than not, a little worst for wear. Two hospices were opened under Islamic Rule by some Amalfian merchants in 1080, one for men and one for women. They were run by quasi-religious Christian people (similar to monks) who volunteered there caring services by the will of God. Around that time things were beginning to get a little unsettled for the arriving pilgrims as certain Islamic fundamentalists/brigands started to attack, rob and kill the weary Christians. This inflamed western Christendom and the Papacy in Rome. Pope Urban II called for a Crusade from Latin Christendom to effectively march on the holy land and convert the inhabitants to Christianity or destroy them. In 1095 this was realized. This resulted in a sharp increase in the amount of Christian bodies needing medical attention and the Hospitallers now under French influence took over the running of many more hospices as Jerusalem and much of the Outremer territories were taken by the Crusaders. As the crusades evolved so did the Hospitallers. Although the Knights Templar (fighting monks) already existed, piously protecting the pilgrims who continued to arrive even in the turmoil, it wasn't until the early 12th century that the Hospitallers started to turn to the sword themselves. In the interim the Hospitallers had grown in strength, numbers and respect as a result of the efforts of the Blessed Gerard who died in1120. By the 1140s the order had started to take in arms, armour and armed servants and it wasn't long before Rome recognized the feasibility of militarizing the order and a new Charter was created.At the fall of Jerusalem in 1187 to the Moslems under Saladin, the Papacy turned its attention to the fighting orders in the area and the Knights Hospitaller was born. Over the next 70 years the story of the Hospitallers never stood still: being tied to the fate of the crusades. After the fall of Jerusalem to Saladin the Order was dislodged and found them making their stronghold in Acre and on Cyprus, from here they continued to be a major participant in the war on Islam and the efforts of the further, decreasingly potent Crusades. Even though the Crusader states started to diminish over the years as the Islamic forces started to recapture the holy land, the need for a Christian fighting presence in the area didn't. It seemed Rome and Christendom wasn't ready to give up the fight. The Hospitallers continued to go from strength to strength despite the tightening Muslim grip and the numbers of new recruits continued to flow. This was not just down to the fervor of the Latin Christians to fight the Muslims but also because the Hospitallers took in applicants from all classes of feudal society so even the poorest could be trained to be a knight or brother-at-arms and live out a rewarding and respected career. The Hospitallers didn't just command the respect of the Christian world but also of the Muslim world, who saw the Hospitallers as men of honour, fair opponents who never faltered from their doctrines charter or morals and people who were ready to negotiate with them when prudence called - an ethos which sometimes displeased the Pope but managed to keep the wolves from the door and perhaps played its part in keeping much of the holy land in Christian hands for as long as it did. By the end of the 12th century much of the war against the Muslims was being fought at sea as this was largely the only way that supplies and men could be brought to fortify the ailing crusader efforts. This along with the fact that the Hospitallers were being bogged down in Cypriot politics forced the Hospitallers to look for a new base. They had the island of Rhodes in their sights. By 1209 they had invaded and conquered Rhodes and now became known as the Sovereign Military Hospitaller Order of St John of Jerusalem of Rhodes. From here they commendably managed many affairs: They continued to ward off attacks by the Islamic forces (mainly Ottoman) and contribute to the last remnants of the land based Christian efforts. They also continued to negotiate treaties and agreements with the Muslims whilst playing a major role in keeping seaward supply routes open and fighting off Islamic naval attacks and pirates. They also had the resident Greek Orthodox Christians (considered by many Latin Christians to be heretics) to also contend with. The stronghold of Rhodes also concerned itself with the management of the Hospitaller concerns abroad. After the dissolution of the Templars in 1312 the Hospitallers gained much of their estate and wealth overseas as well as already having a great many properties and hospices across Europe; wherever the Latin Church existed the Hospitallers enjoyed mutual and neutral respect and their hospices continued to supply medical needs for the sick and dying and their military might was felt anywhere were the Catholic church was under threat from the Heretics.